Madison Graham,17, lay on her back on the floor of the room, surrounded by caretakers and medical equipment. HOULTON, Maine — Madison Graham,17, lay on her back on the floor of the room, surrounded by caretakers and medical equipment. The young women around her questioned her about what happened, what hurt, and teamed up to gently roll her over so as not to do any further damage in case she suffered a spinal injury. That is when things went awry. The two teenagers, both seniors at Katahdin High School, paused to laugh briefly during the recent exercise along with fellow 17-year-olds Kate Anderson and Hannah Drew, who are also KHS seniors enrolled in the emergency medical technician program at the Region Two School of Applied Technology in Houlton. The course, taught at the Houlton Fire Department by longtime instructor and Houlton Fire and Ambulance Department Paramedic Glen Targonski, teaches students basic level EMT skills. After the 36-week course is completed, students are eligible to take the National Registry EMT exam. Dave Keaton, the director of the Region Two School of Applied Technology, said on Thursday that the course is in its fourth-year of existence and is one of the more popular ones at the learning institution. Students start out learning the basics of medical terminology and patient assessment before moving on to more complex instruction, such as dealing with respiratory and cardiac emergencies and safely and properly extricating injured patients at accident scenes. 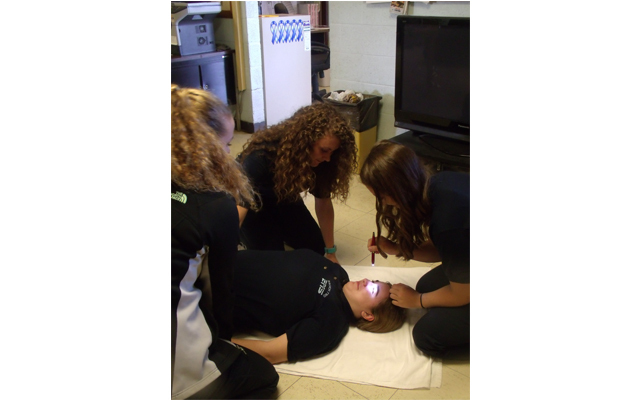 Along with putting in the required classroom time, students also must spend time getting hands on education by doing clinical work in an emergency room and riding along with the Houlton ambulance crew. Keaton said that Houlton ambulance personnel have been cautious in making sure that students do not go out on calls that they perceive as too upsetting or traumatic for them at this early stage. He said that students are encouraged to take the health science class at Region II, which is a standardized state Board of Nursing class. He said that this allows students to discover if they faint at the sight of blood or don’t function well in a medical environment. He said the class also teaches them the basics of medical privacy laws and helps them grasp the many emotional issues involved in medical care. Not only are students acquiring these skills when they are still in high school, Keaton said that the students are helping to fill a significant void in the community and the state. Madison Graham said on Thursday that she enjoys the hands on learning in the class. Graham, who has done nine ride alongs with the ambulance crew, said that a majority of residents have been very receptive to having a teenager on the scene learning the ropes.